GTU President, Mark Lyte, addressing teachers in Bartica yesterday. Parents as well as teachers have been throwing their support behind the Guyana Teachers’ Union [GTU] and its membership as planned strike action nears. According to Lyte, the Union has been diligently appealing to parents for their understanding as it prepares to engage industrial action. As part of the appeal, a letter endorsed by the Union has been making its rounds on social media urging parents to be understanding during its planned strike action. “We are not sure which one of our teachers took the initiative to author that letter, but we fully endorse it,” Lyte told this publication yesterday. The letter went on to outline that teachers are not only educators but also act as nurses, counsellors, janitors, designers and many other roles as they cater to the children in their charge. Since the start of the week, the Union has been vigorously working to mobilise its membership to support the strike action aimed at retaliating government’s refusal to offer a favourable salary package to public school teachers. According to the GTU President, the forthcoming support has been overwhelming. 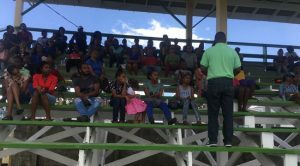 Although yesterday was a national holiday, it did not prevent teachers in Bartica, Region Seven from coming out in their numbers to meet with their Union to hear about the planned strike action. At the meeting held at the Bartica Secondary School, the presence of some 80 teachers was felt. The day before the Union had reached out to its membership in Linden, Region 10, where some 300 teachers gathered at the Lichas Hall to interact with the leadership of the Union. Teachers in Georgetown and in Region Four were also addressed by their Union leaders earlier in the week. “Our teachers are fully behind us,” said Lyte as he reaffirmed plans to commence strike action on Monday August 27, 2018, although the new school year is set to commence the following week [from September 3, 2018]. According to Lyte, the start of the strike action is expected to affect schools’ pre-term activities. While the Union and its membership have agreed to two weeks of strike action initially, Lyte said that any further action will be dependent on government’s reaction. Following two recent meetings, the Union heard that government was not prepared to agree to, among other things, the increased salary percentage detailed in the Union’s multi-year agreement proposal. At the end of 2015, a multi-year salary package between the Union and the previous government came to an end, which saw the Union crafting and submitting to the Education Ministry a new proposal intended to span the period 2016 – 2020. Entailed in the proposal were, among other things, a 40 percent across the board increase for teachers for 2016; 45 percent increase for last year and 50 percent for this year and the following two years (2019-2020) for all categories of teachers. As he stressed the purpose of a negotiation process, Lyte said that government, instead of countering the Union’s percentage increase, simply proposed another round of negotiation by a ‘specialist’ who will have to be recruited for this purpose. This is in spite of months of negotiations between the Union and the Ministry of Education, followed by more months of negotiation by a high-level committee, which was established by government, complete with several government officials and representation from the Union. To show its dissatisfaction, Lyte said, the Union will continue mobilising its teachers for strike action in Essequibo today and continue to do so in Berbice tomorrow.